Try one of our favourite game recipes this winter, from pasta with a rich wild rabbit sauce to popcorn pheasant. 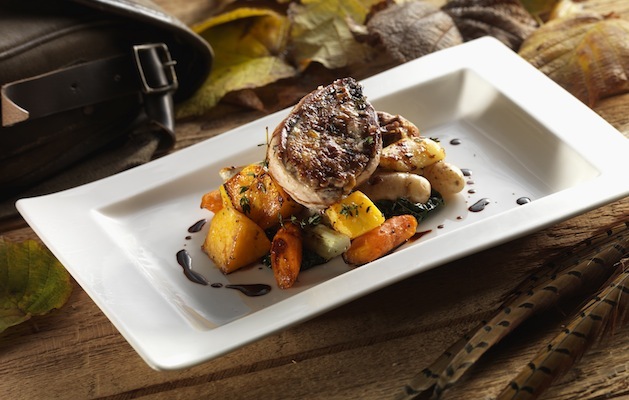 Delicious, healthy and endlessly versatile, game really is a cook’s best friend at this time of year. Make the best use of it with these five easy recipes. Fry 75g cubed smoked pancetta in olive oil for five minutes. Add a grated carrot, a stick of grated celery, a grated medium onion and three finely chopped cloves of garlic. Give everything a good stir, then add a pinch of dried chilli, nutmeg and cinnamon, a teaspoon of dried rosemary and a bay leaf. Cook for five minutes, then add the chopped meat from one wild rabbit and four tablespoons of tomato purée. Cook for another couple of minutes, then pour in a third of a tin of chopped tomatoes, a teaspoon of white wine vinegar, 200ml white wine, 100ml water and a thumb-sized piece of Parmesan rind (this will give the sauce extra flavour, but don’t forget to remove it before you serve). Meanwhile, cook 175g of penne pasta in boiling salted water and drain. Mix it through the ragu sauce, then divide between four plates. Top with grated Parmesan. Season eight wood pigeon breasts and cook, skin-side down, in a non-stick pan for two minute, before turning them over a cooking for a further two minutes. Remove from the pan and rest for five minutes. Warm some cooked, diced black pudding and place in a bowl. Add 40g baby salad leaves, 200g cooked, diced beetroot and 100g blackberries, season and drizzle with olive oil and lemon juice. Toss everything together, then arrange the salad on plates and top with the pigeon breasts. Season four pheasant breasts, sear in a pan and set aside. Place 50g diced carrot, 50g diced swede, 50g diced butternut squash and 50g diced celery in a thick-bottomed casserole dish, arrange the pheasant breasts and some sprigs of fresh thyme on top, and pour over 500ml game stock. Put the lid on and cook for two hours in the oven at 160ºC. Rest before serving with some green, leafy vegetables. Perfect for drinks parties. Cut two skinless pheasant breasts into 2cm cubes. Mix three tablespoons of condensed milk with two tablespoons of cold water, two beaten eggs, a pinch of dried chilli powder and half a teaspoon of ground cumin. Dust the pheasant pieces in cornflower, then dip into the egg mixture, before dropping into a bowl of cornmeal or polenta and stirring to coat. Fry in small batches in 2cm of rapeseed oil in a pan, heated to roughly 175°, for three to four minutes, until golden brown. Drain on kitchen paper, sprinkle with a little salt and serve hot with a spicy dipping sauce. Season 1kg minced venison or other game. Heat a couple of tablespoons of oil in a heavy-based frying pan until almost smoking, then brown the meat in small batches. Heat two tablespoons of oil in a heavy-based saucepan and gently fry three finely chopped onions with two crushed cloves of garlic, four juniper berries and a sprinkling of chopped thyme leaves until very soft. Add the meat, dust it with flour and stir in a tablespoon of tomato purée. Cook for a few minutes, stirring constantly. Add a tablespoon of Worcestershire sauce, then slowly stir in 200ml cider and a litre of good-quality beef stock. Bring to a simmer and cook gently for about 1 hour. 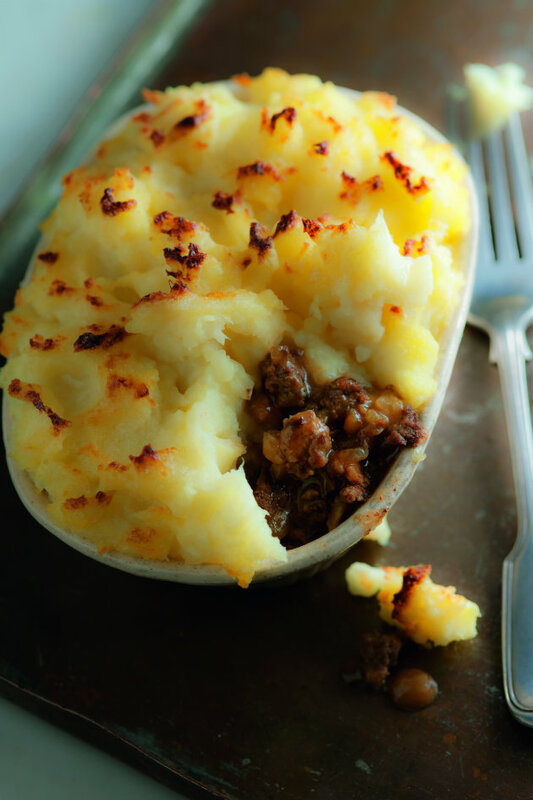 Set aside to cool, then top with mashed potato, ruffling up the surface with a fork. Bake at 200°C until the topping is golden.